The latest round of campaign fundraising reports show continued signs of of Democratic enthusiasm, though some Republican incumbents, including U.S. Reps. Pete Sessions and Will Hurd, posted strong third quarters. After Democratic challengers outraised four Texas Republicans in Congress earlier this year, some Republicans recaptured fundraising momentum in the third quarter – but not all of them. Campaign finance reports for federal candidates covering July through September were due on Saturday. The reports show signs of of Democratic enthusiasm continuing, though U.S. Reps. Pete Sessions of Dallas and Will Hurd of Helotes, both Republicans, posted strong third quarters. U.S. Sen. Ted Cruz, R-Texas, barely outpaced his challenger, U.S. Rep. Beto O'Rourke, D-El Paso, and two GOP congressmen saw Democratic challengers raise more money. Hurricane Harvey may have depressed fundraising overall, with many incumbents and challengers posting lukewarm quarterly hauls. "I don’t think it’s appropriate and certainly not tasteful to raise money from people who’ve been devastated and lost everything," said U.S. Rep. John Culberson, a Houston Republican who was outraised by two of his Democratic challengers. Democratic numbers were also smaller, suggesting candidates who announced earlier this year picked off the low-hanging donors in their previous campaign reports. And candidates who entered races only recently had less time to raise money. But also, there was a larger dynamic at work. Ali Lapp is the operative who oversees the super PAC that supports Democratic House candidates, said donors are holding back from challengers because of the crowded nature of the Democratic primaries. "With so many good Democratic candidates running in primaries, it’s no surprise that many Democratic donors are waiting to give direct candidate donations until after the field shakes out a bit, or even until after the primary is concluded," she said. Last week, O'Rourke announced he would report $1.7 million in fundraising. Cruz promptly announced a $2 million haul – but that included his individual campaign, his leadership PAC and a joint fundraising account. Cruz's campaign filing to the FEC, obtained by the Tribune Monday, offers an apples-to-apples comparison between the two candidates. It showed that his individual campaign raised $1.76 million, or $52,042 more than O'Rourke. Cruz reported a $3.58 million cash-on-hand advantage. Culberson is one of two Republicans in Congress from Texas – the other is Sessions – drawing high interest from Democrats because Democrat Hillary Clinton carried these two districts last fall, even as Republican Donald Trump won the state by 9 points. 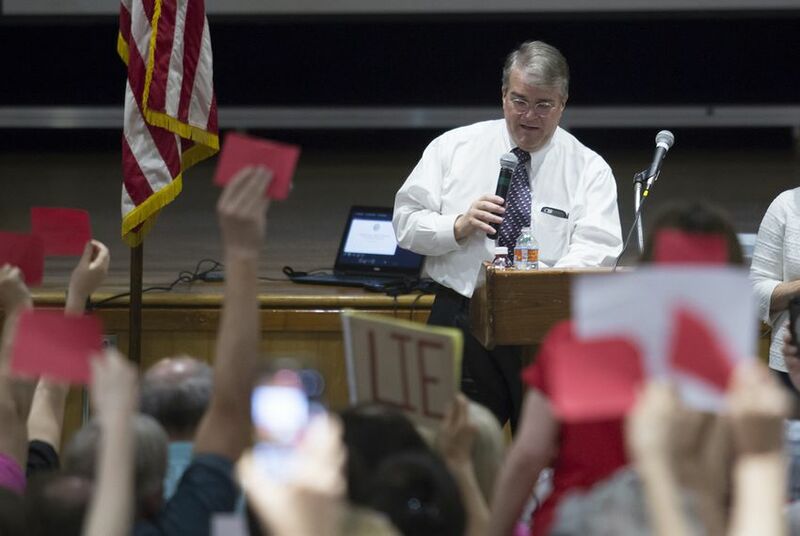 Culberson was again outraised by two Democratic challengers, Alex Triantaphyllis and Lizzie Pannill Fletcher. Culberson posted a $177,000 haul, while Triantaphyllis drew $217,000 and Fletcher $185,000. The two Democrats not only raised more than the incumbent during the period, but they also emerged from the quarter with larger war chests. Culberson had $389,000 in the bank, while Triantaphyllis had $536,000 — the most of any Democratic congressional challenger in the state — and Fletcher $403,000. A third Democrat looking to take on Culberson next year – Laura Moser – came close to also outraising Culberson, taking in $167,000. Hurd posted a $400,000 haul and now has $870,000 in cash on hand. The national GOP is all in for him and have underscored his re-election as a top priority. Hurd's sprawling district, which spans most of Texas' border with Mexico, is widely viewed as the most competitive in the state. The Democratic side is murkier. Former prosecutor Jay Hulings raised $200,000 in about six weeks' worth of campaigning, while former Air Force Intelligence Officer Gina Ortiz Jones raised $104,000. Hulings leaned in part on donations from several members of his Harvard Law School class, like U.S. Rep. Joaquin Castro, D-San Antonio. There are early signs that other members of Congress are beginning to coalesce behind him: Two members of Democratic House leadership – U.S. Reps. Steny Hoyer of Maryland and Joe Crowley of New York – also donated to his campaign. Sessions ramped up his fundraising a bit in the third quarter, raking in $437,000 after raising $401,000 during the last period. Democratic challenger Ed Meier emerged as the fundraising leader in the crowded primary to challenge Sessions in 2018, taking in $242,000 in the third quarter — the biggest quarterly haul of any Democratic congressional challenger in the state. At the same time, another Democratic candidate, Colin Allred saw his fundraising sharply drop to $62,000 for the third quarter after debuting with a $206,000 haul during the previous period. The drop came as Allred spent big on online fundraising consulting — nearly $70,000 to one firm alone during the third quarter. A third, newer Democratic challenger, Lillian Salerno, received $133,000 in donations from supporters during her first 18 days of campaigning. Sessions still has much more cash on hand — $1.2 million — than any of his Democratic challengers, with the closest war chest — $438,000 — belonging to Meier. Non-profit executive Todd Litton surprised many in Texas politics when he outraised U.S. Rep. Ted Poe, R-Humble, in the second quarter this year. He came up short this time around, but not by much. Litton raised $116,000 to Poe's $132,000. With a historically Republican DNA, this district is not considered a top-tier race. But Litton is running a professional, if long-shot, campaign and some political observers have speculated that this district could come into play if a major Democratic wave sweeps the country. As for Poe, mega-donor John Nau III gave to the incumbent, an indicator that more money could pour into the district at the first sign of trouble. While Litton nipped at Poe's fundraising, Poe has a substantial advantage with his cash-on-hand sum: He has over $2 million in the bank. U.S. Rep. Lamar Smith, R-San Antonio, was one of two incumbents who found himself outraised this cycle, marking the second time it has happened this year. Challenger Joseph Kopser raised $213,000. just above Smith's $199,000 and well ahead of several other Democrats vying to challenge Smith. Smith is the chairman of the House Space, Science and Technology Committee and should be able to kick his fundraising up if he senses trouble. Moreover, he has nearly a $1 million in cash-on-hand. State Sen. Van Taylor, R-Plano, raised over $1 million in the first five weeks of his campaign to replace retiring U.S. Rep. Sam Johnson, R-Plano. The haul included a combined $500,000 in loans from the candidate, who is independently wealthy. Taylor has $916,000 in the bank heading into the fourth quarter. He faces a lesser-known primary rival in Roger Barone, a Plano businessman who has not filed any campaign finance reports with the Federal Election Commission since he launched his bid in April. Democrat Veronica Escobar, the former El Paso County judge, pulled in $333,000 in just over the first month of her bid to replace O'Rourke who is running for U.S. Senate in 2018. Escobar's most prominent primary opponent is Dori Fenenbock, the former El Paso school board president. Fenenbock, who has been in the race longer than Escobar, raised $257,000 in the third quarter, $50,000 of which came from the candidate. Entering the next quarter, Fenenbock has $405,000 to spend versus Escobar's $297,000. Claire Allbright contributed to this report. Correction: A previous version of this story gave incorrect information about which candidate in Texas' 2nd District had more cash on hand. U.S. Rep. Ted Poe had the cash-on-hand advantage. Are any Texans in Congress ready to retire in 2018? We asked them.